Harmonize your hormone levels and support the mature female reproductive system with Wild Yam & Chaste Tree combination. Supplies nutrients for glandular function. Nourishes the female reproductive system. Provides support for menopausal women. 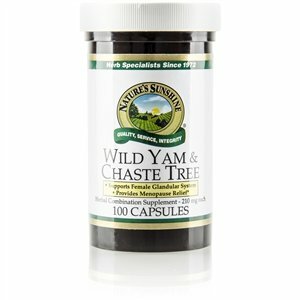 Wild yam and chaste tree berries feed the glandular system. Wild Yam was commonly called colic root 100 years ago in the U.S. It is also famous in Chinese herbology. Chaste tree, also known as vitex, was called monk’s pepper during the Middle Ages. It is commonly used to support menopausal women. Wild yam can be used for a variety of female concerns, while chaste tree berries nourish the pituitary gland, where other hormones are produced. These two herbs work together to support ideal hormone levels and enhance glandular and reproductive health. Wild yam root extract and chaste tree berries extract. Take 1–2 capsules with a meal twice daily.